Big Brother Africa 1 Ugandan contestant Gaetano Kaggwa has bounced back on the reality TV scene but this time as a presenter. The former Studio 53 lifestyle magazine presenter will co-host the All Stars TV show with Eve D'Souza. The two were chosen after competitive auditions for their compelling stage performance and experience that will be unveiled during the inauguration of the show on Sunday, June 26, 2011. Tusker's Regional Manager Mburu Karanja said; "We have exciting plans for the show over the next few weeks, including some surprise celebrity guests and amazing performances from the Tusker All Stars." 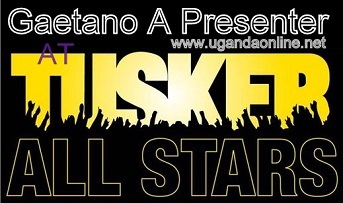 The eight stars who include last years winner who happens to be none other than Hillary Davis Ntare from Uganda, Amileena, Caroline, Msechu, Rwanda's Alpha, Patricia, Hemedi and Ng'ang'alito will be showing East Africa their talent. The live show will be showing on UBC every Sunday at 7:30pm with effect from 26.Jun.2011. Citizen TV in Kenya and Tanzania's TBC will be showing the Tusker All Stars at 7:30pm. Fans in Rwanda can catch up with the fun every Monday at 9:30pm on Rwanda TV. The show will start on Jun 26 and end on Aug 14.